Electrical Houses, DSL Cages & Control Cabs’ for three Ladle Furnace Cranes currently in service at the Stainless Melting & Continuous Casting facility operated by the UK based Long Products Division of the worlds leading stainless steel producer. 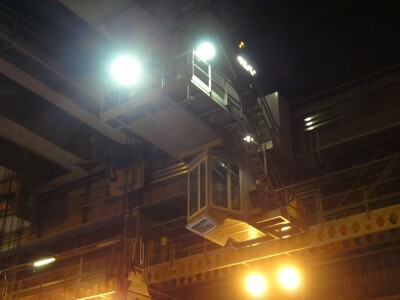 To design & manufacture the equipment to the customer's specific requirements, following independent structural engineers criteria, considering material specification, surface preparation, protective coatings and the friction grip / through hardened type fixing arrangements necessary to safely suspend all the equipment from the cranes gantry beams - all programmed to meet a very short delivery time-scale for installation during the customer's summer shut-down period. All items to be of a robust and durable design, suitable for operation in the noisy, dirty & dusty conditions associated with this heavy industry, and fit for purpose in providing a safe working environment for operators and maintenance personnel alike, whilst reducing internal crane cab noise levels. Electrical Houses comprised of a structural steel skeleton over-clad in heavy gauge steel plate (fully stiffened to accommodate control panels & electrical switchgear) with personnel / emergency exit door, a central gangway complete with stanchions, handrailing etc., an internal runway beam & electrical hoist, numerous sealed service(s) apertures and electrical safety matting to floor. DSL Cages manufactured in a similar fashion to the Electrical Houses, designed to carry the necessary equipment to facilitate the transfer of electrical power from the `Down Shop Lead / Busbar’ system. Crane Cabs comprised of a complex structural steel skeleton with acoustic infill panels & personnel door, protected by a heat shield suspended beneath, and fitted with inward-opening (for cleaning from within the cab) triple-glazed projectile-safe windows to walls & floor areas (safety grilles at floor level) having sacrificial outer panes – all to provide the correct lines of vision. Installation of lighting & power, an internal monorail system & electric chain hoist, ventilation ports for integration with an existing air conditioning system, rubber floor matting, operator swivel chair & trainee’s fold-up seat completed the turnkey package. An external noise level of 95dB(A) was reduced to 65dB(A) inside the Crane Cab, well below the customer target noise level of 70dBA and the First Exposure Action Level (80dBA) of the Control of Noise At Work Regulations 2005, reducing the operator's daily noise exposure and allowing him to effectively communicate by radio in a stress-free, comfortable environment.